Douchanglee Crosses the Ocean to Set-up Shop in Park Royal: Taiwanese fashion brand Douchanglee recently opened its first Canadian location at West Vancouver’s Park Royal. Launched in 1995 by Dou Teng-huang and Zhang Li Yu-jing, the duo presented their first concept store in 2003. Canadian licensee Jack Wang brought Douchanglee to Canada after encouragement from his wife, who is a fan of the brand. He said that she found it challenging to find clothing from other brands in the Lower Mainland with a similar fit, quality and styling, prompting the entrepreneur to strike a deal with Taiwan’s Douchanglee to enter the Canadian market. It helped that Wang and his family are friends with the husband-wife duo behind the brand Ten-huang and Yu-jing. 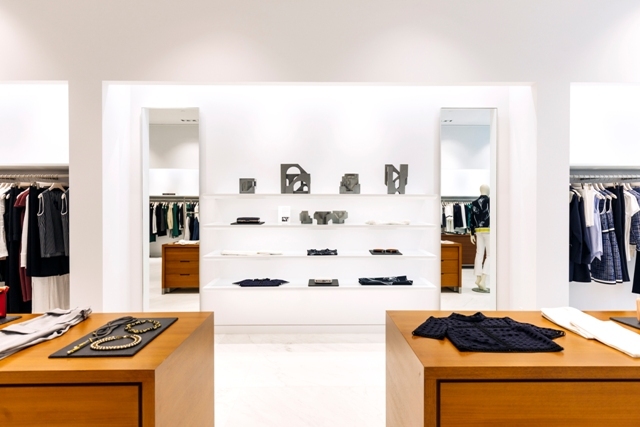 The 2,500-square-foot store has elements of avant-garde and retro chic throughout with the use of stainless steel, acrylic, velvet, and leather, as its key visual elements. Stocking the Spring/Summer 2018 offerings the new location in Park Royal will also have a selection from previous collections; fans of this elegant and unique line enjoy the versatility of the pieces for day/night wear. Douchanglee currently operates several stores throughout Taiwan (5 boutiques, 9 department store ‘corners’ and 4 franchises), and will soon open in Paris, France. *Both photos above are courtesy of Lee Rivett. Marquess Jewellers Unveils Impressive New Retail Space: Family-owned Marquess Jewellers in Toronto, known for its custom jewellery designs as well as exceptional repairs, has renovated its retail space at 12 St. Clair Street East on the lower level of the St. Clair Centre, just off of Yonge Street. Third-generation Marquess Jewellers has been in business since 1983 and it carries a wides selection of affordably-priced gold and silver earrings and necklaces that are sources from Italy, New York City, Los Angels and Montreal. The retailer also appraises jewellery and can do custom engraving, and it also offers on-site watch battery replacement, watch repair, and metal and leather watch bands are available. The store is located in one of the best locations in Toronto, with some of the city’s wealthiest neighbourhoods close by — Rosedale, Forest Hill, South Hill and Moore Park are within walking distance. Mississauga-based BUILD IT by Design overhauled the space with an extensive renovation that has created an essentially new store. Custom light fixtures were imported from California and LED lights were custom made to match the colour temperature of the light fixtures throughout the space. Custom imported wall tiles, measuring 48” x 48” were installed in the space. BUILD IT by Design also created intricate display cases that were made in-house using three mixed elements — glass, metal, and wood, featuring custom hardwood turned legs. Be sure to check out the newly reopened store when you’re in the area, which is part of the St. Clair Centre which is also seeing some exciting changes to coincide with the rebirth of the entire area. *Photos above are via Candace May Photography for BUILD IT by Design. Judith & Charles Splits from the Mall and Hits Granville Street: Montreal-based women's fashion brand Judith & Charles brought its unique client experience to a new and exciting downtown setting when they recently opened a new store at 640 Granville Street in Vancouver. Laid out over 2293-square-feet, the location opened with a low-key event for style bloggers on May 1st. Embodying Judith & Charles’ upscale experience, this new store promotes fashion and art in a gallery-like setting. The interior adheres to the brand’s ‘less is more’ aesthetic and showcases clean lines, natural materials, and a neutral palette. The latest collections are displayed next to Jane Carr scarves, exclusive to Judith & Charles, as well as the artwork of Montreal-based sculpture artist David Umemoto. His minimalist sculptures are influenced by geology, the repercussions of time and weather, and made out of concrete. The exhibition of Umemoto’s work will be held until August 2018. Fifty percent of each sale will go towards Charlie’s Foundation, an initiative launched in 2015 by the Le Pierrès. The foundation is a non-profit organization that teaches Dominican youth the English language, connecting them with the wider world and improving their future career prospects. CBRE broker Michael Mylett acted on behalf of the landlord in the Granville Street lease deal. Below: More photos of the store, courtesy of Judith & Charles. OpenRoad Auto Group Pops Its Cork at New Rolls Royce Showroom: Rolls-Royce Motor Cars Vancouver, part of OpenRoad Auto Group, marked the official grand opening of the brand’s new Vancouver showroom on West 5th Avenue, with two Moet drenched events. The first Champagne tower was poured for media and the second later in the evening for VIPs and over 200 Rolls Royce owners. The new location is also Canada’s first stand-alone Rolls-Royce retail facility. The evening was doubly exciting for luxury car fanatics as the company also revealed the highly anticipated Cullinan SUV, marking the first time the luxury automaker has held a new model debut in Canada. The 4,500-square foot, two level luxury automotive retail centre offers an elegant showroom featuring high-end finishes, premium architectural details, a snow machine, and space for up to six Rolls-Royce models. All other Canadian stores combine Rolls-Royce with other luxury car brands like Karma or Lamborghini. Rolls-Royce Motor Cars Vancouver is currently the top Canadian volume dealer and one of the top-selling Rolls-Royce dealerships in the world. OpenRoad Auto Group acquired the Vancouver Rolls-Royce retail store in 2014. After 15 Years of Service to Beauty, Victoria Radford Opens Radford: Beloved Toronto-based make-up artist and aesthetician, Victoria Radford has launched her first salon aptly named Radford, in Toronto’s premier lifestyle shopping destination Yorkville Village. With 15 years of expertise in beauty and holistic medicine, Radford wants to create a new approach to make-up and skincare. The opening of the salon is the first step in sharing her philosophy with a wider market. The new Radford salon, located in the Upper Oval, offers a wide selection of luxury services to make guests look and feel glamorous. Radford offers in-studio make-up applications, hair styling, cutting and colouring, in addition to customized skin treatments to target any skin type effectively. In addition to an array of principal services, Victoria Radford’s personal beauty line is available for purchase at the salon. Interesting note - Yorkville Village is currently undergoing Phase 2 of the redevelopment, continuing through 2018 and will welcome prime new retailers, including several first-to-market luxury brand introductions to the Bloor-Yorkville neighbourhood. We cannot wait to announce more retail launches as they happen. Perverted Ice Cream Bringing Dairy Deviance to Vancouver: Tinted windows and black walled interiors have replaced the pretty pink décor of Cupcakes on Thurlow Street. Perverted Ice Cream opened on May 16th and encouraged patrons to play it up with the hashtag #everytimeicomeicecream. The soft-serve ice cream is made with organic milk and no artificial stabilizers. 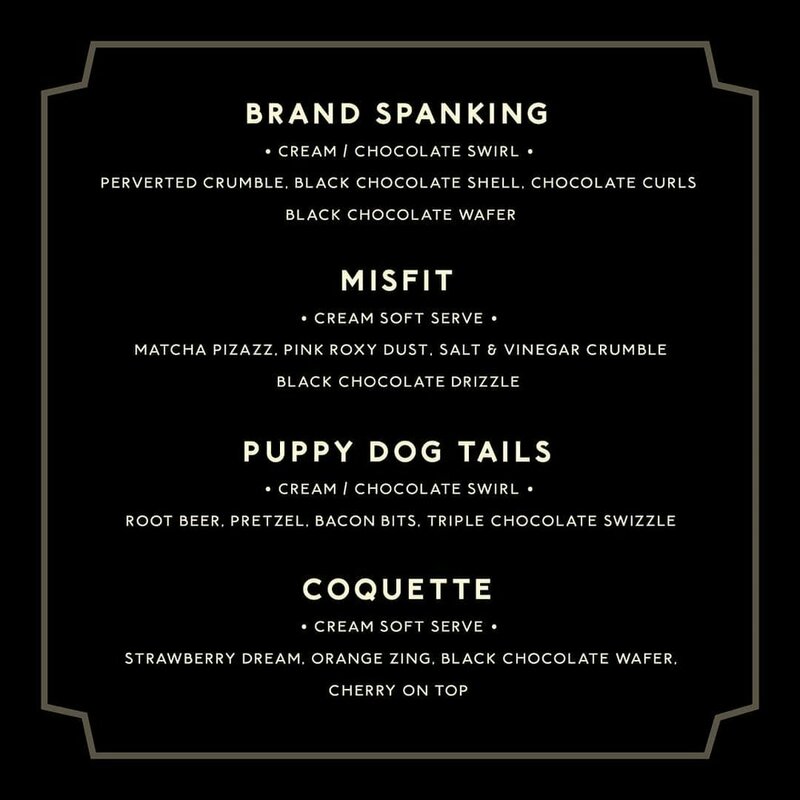 Black charcoal waffle cones are handmade every day, and embellishments include bacon bits, gold leaf, pink roxy dust, salt & vinegar crumble, toasted French fries, and torched cheese curd. Perverted is not the only irreverent ice company to launch in Vancouver. Toronto’s Sweet Jesus is bringing their finger-licking to Metropolis at Metrotown in July, and if controversy is good for business, both these companies should do very well. Incredibly, in our no-fun city, Perverted ice cream lovers will be able to enjoy a cone during a Robson Street stroll until 2 am on weekends! (Photos above are from Perverted Ice Cream's Instagram account). Rocky Mountain Soap Company to Lather-up Toronto with 3 Summer Pop-ups: Rocky Mountain Soap Company, the Alberta based nature-sourced bath and beauty brand, brings three new pop-up shops to Toronto this summer to serve up their toxin-free products to the people, and to test out the east coast market for future expansion. The retail locations will pop-up in July at CF Toronto Eaton Centre, with PATH and Yorkdale Shopping Centre in August. 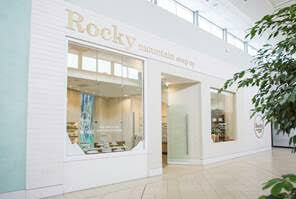 The storefronts will be stocked with Rocky’s full product range for the whole family and invite customer interaction, allowing shoppers to lather up with soaps and scrubs at wash stations, test face and body lotions and learn more about the brand's more than 200 natural products. As a female-led and values-based enterprise, Rocky Mountain Soap has maintained its growth and loyal following by focusing on natural, simple ingredients, environmentally-conscious processes, and community. Did you know that natural beauty products are the fastest-growing segment of the beauty industry? Rocky Mountain Soap Company is fortunate enough to have benefited from this trend as is everyone who is switching to natural products! Is Railtown the Future of Retail in Space Challenged Vancouver? With the relatively recent ‘Creative Products Manufacturing I-4’ zoning in Railtown, the 400 block of Railway Street will be redeveloped by architects OMB (Office of Mcfarlane Biggar Architects + Designers) on behalf of client Niels Bendtsen. Affected by the redevelopment will be Bendtsen’s companies Inform Interiors and Bensen, both long established in this area. The new mixed-use development will be six-stories in height, just under 112,000-square-feet and consist of recessed storefronts, a restaurant, a glassed-in central atrium with open walkways, two rooftop terraces, and three levels of underground parking. Hype City 3 Sneaker Convention is Kicking into the Harbour Convention Centre: The call has gone out for all ‘sneakerheads’ to get ready for what is going to be the calendar event of the year – Hype City 3. Two Facebook groups - Vancouver Sneakerheads Group and Vancouver Streetwear Community are bringing the third incarnation of Canada’s largest sneaker and streetwear event to the Harbour Convention Centre on June 3rd. This new location allows for much-needed growth and accessibility for both vendors and attendees. Hype City 3 will bring in some of the world’s highest streetwear and fashion commodities for sneakerheads to shop. Passes will get attendees access to over 75 tables of rare vintage, luxury (including the largest Supreme collection in Canada) including Yeezy, limited edition hype pairs, art, and collectibles all with the sneaker theme. You can also take part in interactive activities and learn about the history of sneakers like the Air Force 1 at Hype City. Attendees will have the chance to win prizes with raffles and give-aways happening throughout the event. Recently announced vendors include Dipt (who will be showcasing the largest Air Force 1 collection in the country), The Liminal Grooming Lounge, and entertainment by Prime Quality Pro. Costco Thorncliffe Park Confirmed and Ready to Roll Out the Cart: American membership-only warehouse club Costco is about to open its fourth location in Toronto at the former Coca-Cola Refreshments Canada head office and bottling plant located at 42 and 46 Overlea Boulevard. Initially slated for a February launch, apparent weather-related construction delays have kept Thorncliffe Park behind schedule, but Costco has officially confirmed the location opening in June. Eager bulk shoppers have been purchasing their new Costco memberships from a white trailer in the parking lot. The massive 165,800-square-foot warehouse store will also offer an incredible 18-pump vehicle fuel station. Rockport Financial Struggles: Rockport Blocker and Rockport Canada et al. (collectively the "Rockport Group"), subsidiaries of Rockport, based in West Newton, Massachusetts, is a global designer, distributor and retailer of comfort footwear in more than 50 markets worldwide. This month, the company brought a motion under the CCAA to recognize in Canada the US Chapter 11 bankruptcy proceedings that the Rockport Group filed on May 14, according to Insolvency Insider. The company partially blamed the separation from its previous owner, Reebok, which sold the company in 2015, for its financial difficulties. The Rockport Group currently owes approximately $53.4 million (USD) under its revolving credit agreement. If the lenders were to require repayment in full of the amounts owed by Rockport Canada, as a co-borrower and under its guarantee of the US debtors' obligations under the agreement, it would be unable to repay the full amount owed. Rockport Canada itself has 64 unsecured creditors that are owed approximately $760 million (CAD).